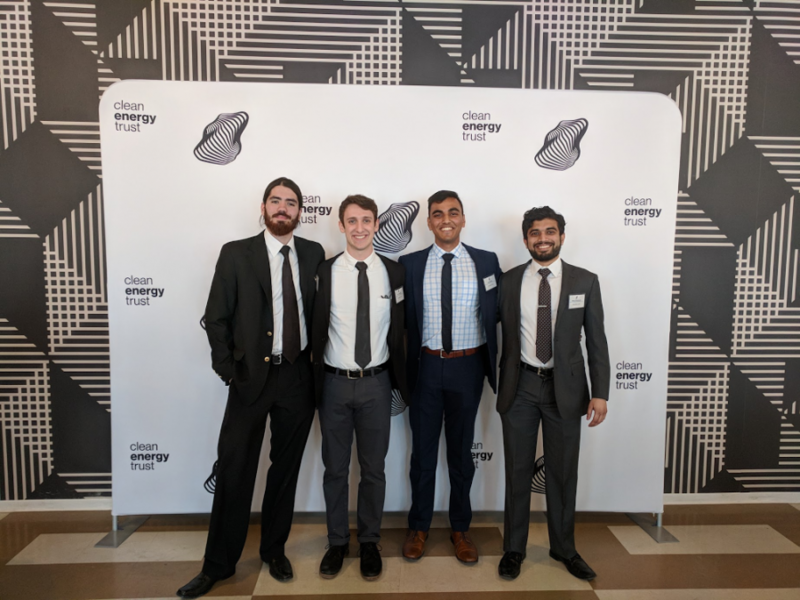 Left to right: Alejandro Owen, Lucas Fridman, Prince Ghosh and Nihar Chhatiawala pose as a team after competing for the U.S. Department of Energy's (DOE) CleanTech University Prize in Chicago on Thursday, Feb. 8. The research group's "Boundary Labs" start-up qualified them as for the Allegheny Prize at Carnegie Mellon University and the California Institute of Technology FLOW Prize, both sponsored by the DOE (not pictured: Amit Verma). A Case Western Reserve University research team of undergraduate and graduate students is being recognized at multiple regional competitions for a project which improves the efficiency of wind turbines. Their startup company, Boundary Labs, strives to expand the efficiency of the clean energy sector. On Feb. 8, the team travelled to Chicago to compete in the regional Midwest CleanTech University Prize (UP) competition, sponsored by the U.S. Department of Energy. According to third-year undergraduate student Prince Ghosh, who created the prototype for Boundary Labs, the researchers qualified as finalists for April’s Allegheny Prize at Carnegie Mellon University and the California Institute of Technology FLOW Prize, both sponsored through the department. Chhatiawala’s financial expertise is crucial to the group dynamic, and he shares a down-to-business mindset with fourth-year undergraduate student Alejandro Owen, a mechanical engineering major. Ghosh’s interest in this subject began during his first semester at CWRU while taking an advanced introductory physics course with Dr. Robert Brown. This course included a weekly lecture on chaos theory, a physics theory regarding dynamic systems—like turbulence or drag—which are phenomena of interest to Ghosh and his research group. Brown is also involved in the sectors of science relating to entrepreneurship and industry, and is pleased that promising young people, like Ghosh, are joining the sector. Ghosh and his fellow research group members are participants of the Great Lakes Energy Institute’s ThinkEnergy Fellowship. According to the Institute, ThinkEnergy focuses on experiential learning and entrepreneurship, giving a students an opportunity to enhance their “energy literacy” and pursue projects out of their comfort zone. Similarly, this is how Ghosh and his team members teamed up and pursued his product prototype. Third-year undergraduate student Lucas Fridman, a chemical engineering and applied data science major who is a member of the research team, was inspired and impressed by Ghosh’s initial prototype. Despite their excitement from competitive success and the expansion of a seemingly untapped market, Boundary Labs’ main objective goes far beyond pure monetary value; the teammates hope to continue their contributions to the company and the energy—specifically clean energy— sector, and see entrepreneurship in their respective futures.